The 2017 DISABILITY AS SPECTACLE Conference was a spectacular success. More than 200 people were present at the conference. Community members and practitioners presented alongside veteran scholars and rising scholars. 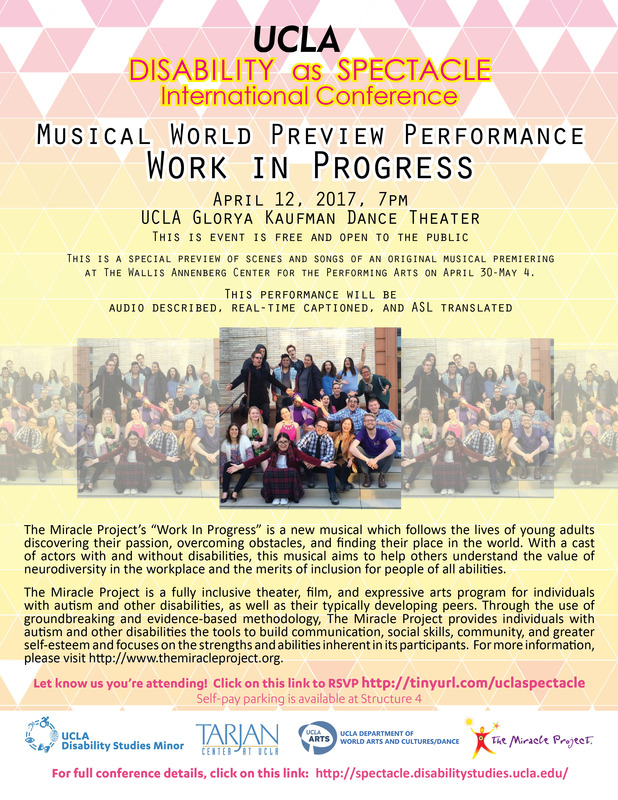 More than 450 people combined attended the open public events with The Miracle Project and Deaf West Theatre. The conference was a conglomeration of the various work that is impacting the disability community, the field of disability studies, and our society. Once again, we wish to thank all who participated in making this a one-of-a-kind event. DISABILITY AS SPECTACLE examines multiple and shifting aspects of visibility and performance. People with disabilities have been, and continue, to be made a spectacle often put on display to evoke fear and pity, or forced to be the center of attention completing quotidian tasks. SPECTACLE, however, has also been used as a tactic for social change, used to disrupt everyday life to demand attention to critical issues. New forms of media and technology has also increased how people with disabilities represent themselves and the ways in which they share their life experience. As such this conference aims to share these complex and dynamic ideas, in theory and practice, with artists, practitioners, students, and scholars. 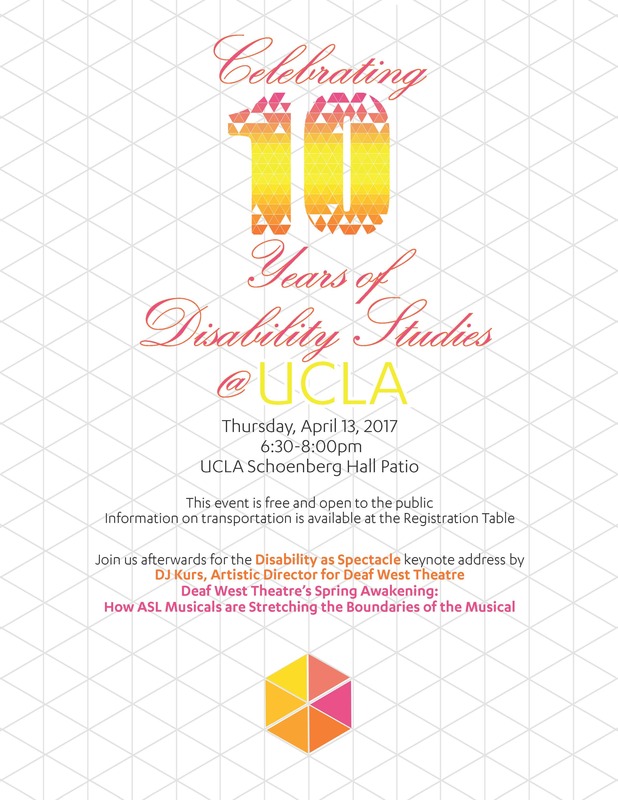 Join us at the conference as we celebrate the 10th anniversary of the UCLA Disability Studies program. Our Anniversary Edition Newsletter highlights our journey over the last decade and our vision moving forward. 8:00 p.m. – 9:30 p.m. Keynote Address: DJ Kurs, Deaf West Theatre (Schoenberg Hall 1100) *This event will be open to the campus community. Disability is experiencing a new wave of visibility in popular culture from autobiographies and parent memoirs on disability to characters with disabilities in film and television to new inclusive initiatives in the areas of art and dance. The examples are numerous: Dancing with the Stars recently featured a veteran amputee, a major motion picture, Kingsman, featured a disabled woman as a central figure, double amputee and fashion supermodel, Aimee Mullins, continues to grace the pages of popular fashion magazines like Elle, Vogue, and Bazaar, and of course the inclusion of disabled athletes, like South African Olympic swimmer Natalie du Toit and NFL player Derrick Coleman, in amateur and professional sports have brought further attention to the achievements and life experiences of people with disabilities. This new visibility raises important questions about how disability is depicted in mass media and which disabilities are excluded or rendered invisible in this new cultural landscape. Does our current moment’s heightened awareness of disability produce benefits or disadvantages in other social, political, or economic spheres? The film and television industry’s central role in disability’s changing status makes Los Angeles the ideal location to reflect upon disability as spectacle. All conference presenters must register by November 15, 2016. Attendees may be photographed or filmed during the duration of this conference and at all affiliated events. Media outlets may include but are not limited to the following: Daily Bruin and UCLA Newsroom.